mathleague.org invites your students to participate in our INTER-regional INTERmediate level Series of Educational Competitive Tests, also known as (INTER)2 SECT. This test series, held throughout the year at locations across the US and around the world, is designed to help top students and teams prepare for state and national MATHCOUNTS. Local qualifying meets use tests that are comparable in difficulty to chapter MATHCOUNTS, and the championship will be comparable in difficulty to state or national MATHCOUNTS. Each contest will conclude with a local awards presentation. As soon as each contest is completed, results are posted online so students can compare their scores to those of other students they are likely to encounter at state or national MATHCOUNTS. We are proud to provide this unique opportunity for students and teams to rank their performance against competitors in other states and hope that this unprecedented level of access to comparative data will help top students and teams prepare for higher levels of MATHCOUNTS competition. Don’t miss out on this exciting opportunity to meet students from other schools and check out how your team stacks up against the competition from around the country! Our biggest change for 2019 is to add a single-site championship round on April 6 where qualifiers from all local contests will be invited to Silicon Valley in California to compete in the national championship. Everyone who has qualified (see How Do I Qualify? below) is welcome to attend this championship. At this event we will hand out awards to the top 10 students in each grade and will declare a national champion school team. The championship site will be hosted in a venue with assigned seating, and there is plenty of space for all qualified students to participate. The $20 registration fee will help to offset the higher cost of the larger venue and staffing expenses. In addition, each student will be given an individual packet at the end of the contest that includes the student's tests along with a copy of the solutions (instead of giving one copy of solutions to each school) and a certificate of participation. In order to encourage more participation from some of the top teams in the US, we will waive the registration fee and school membership fee for students who were on their state's MATHCOUNTS state championship team in 2018 or 2019. If your school team won MATHCOUNTS state, you probably wonder how your team ranks nationally, but of course MATHCOUNTS only invites the top four individuals from each state to nationals. That's where we come in! 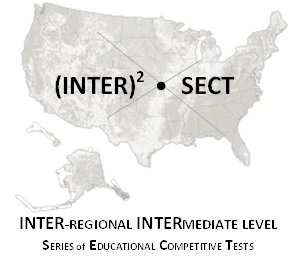 (INTER)2 SECT is your opportunity to compete as a school team at a national championship and see how your school ranks nationally. How Do I Qualify For the (INTER)2 SECT Championship? Earns at least 50% of the available points on either the Sprint or Target round. Scores strictly higher than 80% of the participants in his or her grade at that contest on either the Sprint or Target round or the overall individual point total (sum of the Sprint and twice the Target round scores). Participates on a team that scores either at least 50% of the available points or strictly higher than 80% of the teams at that contest on the Team test. You can evaluate your students' status by going to our results section and selecting the appropriate contest(s). In addition, any students who were on their state's MATHCOUNTS state championship team in 2018 or 2019 will qualify for the championship regardless of whether they attended a qualifying meet or regardless of their scores at any qualifying meets they attended. How Can I Sign Up For (INTER)2 SECT? Click here for a listing of our (INTER)2 SECT sites for this year. Click on the site you plan to attend for more information and a link to register. Sites will be added throughout the year, so check back often for more contest listings. If you don't see a contest in your area, contact us at operations@mathleague.org for information about how to bring one of our qualifying sites to your area. If you have qualified for the championship meet, you can find out more information and register here. If your school is not already registered for the official MATHCOUNTS competition, make sure to get involved in that program. MATHCOUNTS can be found at www.mathcounts.org.